One of my earlier posts was about my Tamiya Challenger 2 model. I've already edited that post to include the new camouflage net that I added recently. But because the original post was written quite a while ago, it's gotten hidden amongst all my other posts! I've also recently taken some better quality pictures of the model. Therefore, this is my new, updated challenger 2 model post! The model itself was a joy to build, Tamiya included some nice litle touches such as clear goggles for the crewmen and clear plastic mineral water bottles that even have tiny decals for the labels on the bottles! To paint it, I mixed Tamiya Acrylics XF59 Desert Yellow and XF57 Buff. To get the right mix of paints, I did a thorough search online for pictures of Op Telic Challenger 2s, the resulting mix of paints, I feel, is as close as I could get to all the pictures that I managed to find. Compare the above picture of the real Challenger 2, with the following picture of my model, I think I have got the paint scheme just about right. Next are the better quality pictures I took after I added the camouflage net. To make the camouflage net, I used some left over mesh material that my wife let me have. I painted the mesh material with XF 59 Desert Yellow. I then sprinkled some mixed herbs onto the painted material that had been soaked with diluted PVA glue. Next I twisted the net and, again using diluted PVA glue to fix the twist, I temporarily stapled the length of net onto a sheet of cardboard until the glue had set. When the glue had set, I carefully layed the net around the front of the tank's hull, trying to make it look like it's lying naturally. The only thing I'm not too sure about is the thickness of the aerials that I made. For some reason, I sometimes have difficulty getting a consistant thickness, when I use the heat stretched sprue method of making aerials. The other small detail that I added, was the gun positon indicator at the rear of the hull, which lets the driver know when the gun barrel is pointing directly aft, or rearwards. I did however, add a detail that shouldn't really be on a tank which is supposed to be on operations, and that is the amber warning light on the rear of the turret. The reason I added it was purely because I liked the way Tamiya had made it from a hollowed out clear plastic part. I painted the inside of it with Tamiya X26 clear orange, with a tiny spot of Humbrol 11 silver enamel in the middle of the base part, to represent the light inside it. I didn't glue the warning light in its socket on the turret, so that if I want to I can leave it off the model. Recently someone pointed out to me that I had put the black N.A.T.O. arrow decals on the wrong way round. 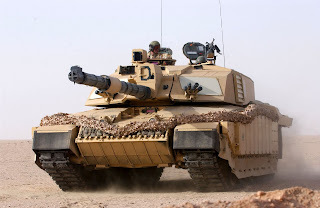 However, after again searching online for pictures of Op Telic Challenger 2s, I have come to the conclusion that I have got them right and the pictures I found back me up in this.